Jaén is a lovely town in Andalucía, surrounded by billions of olive trees – in fact the province of Jaén is known as the Olive Oil Capital of the World. Because the town is on the edge of the mountains, as you drive in from the north everything in town slopes steeply uphill. The central area of Jaén is filled with lots of lovely narrow streets and passageways, and many squares where people gather at cafes. When we drove into Jaén we followed tram tracks that were set in artificial grass – quite remarkable. Also remarkable is that fact that the tram system was finished in 2011, ran for only two weeks, and was then shut down, probably forever, all for the low, low cost of only €120 million. This is a hard climb from Los Villares, with two distinct sections. The first 13 km is on lovely roads and is steep in parts but never too steep. 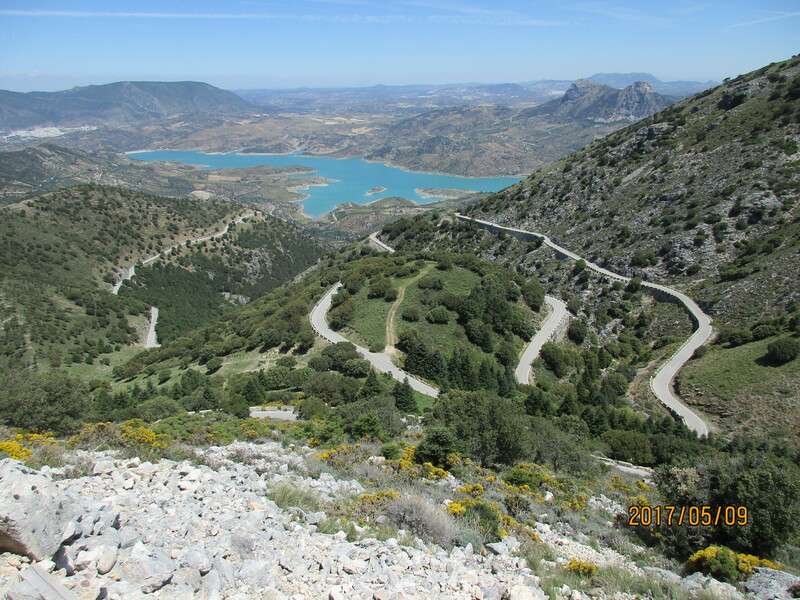 The second part, the actual Sierra de la Pandera climb, is much steeper, with a narrow road, lovely views, several very steep sections, and a fascinating finish through barren limestone highlands. From Los Villares it’s a 30.5 km roundtrip, with 1,280 meters (4,199′) of climbing. 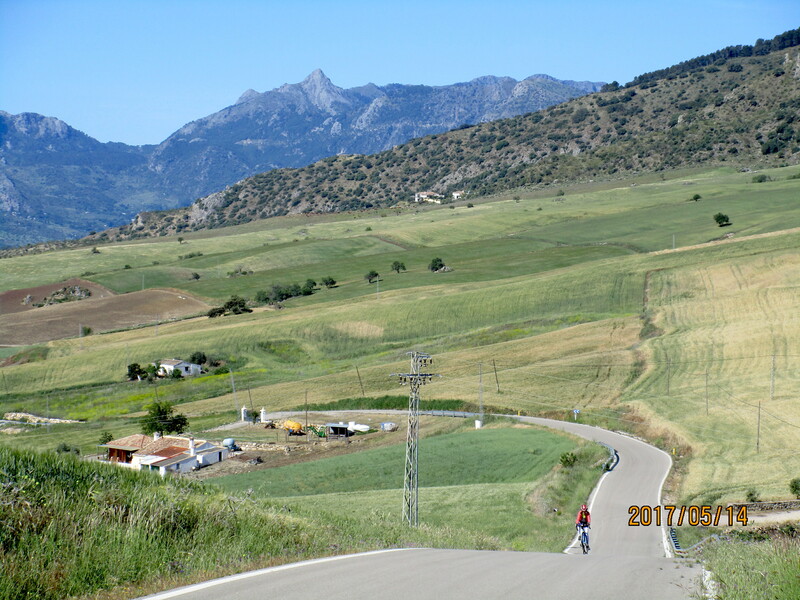 Sierra de la Pandera has been used in the Vuelta a España four times, and is apparently sometimes called the Angliru of the South. However, this is a bit of an exaggeration because it’s not a consistent climb and the angle eases considerably between the steeper sections. There is a dedicated bike lane for the 10 km between Jaén and Los Villares, so you could easily start in Jaén. However, I drove to Los Villares and parked on the right at the south end of the town, just before the sign showing you are leaving Los Villares. Head up the valley on the A-6050 towards Valdepeñas de Jaén. You can see the radio tower that you will eventually be heading up towards. After 3 km you can see a big switchback to the right, and you will start this at about 4.6 km. 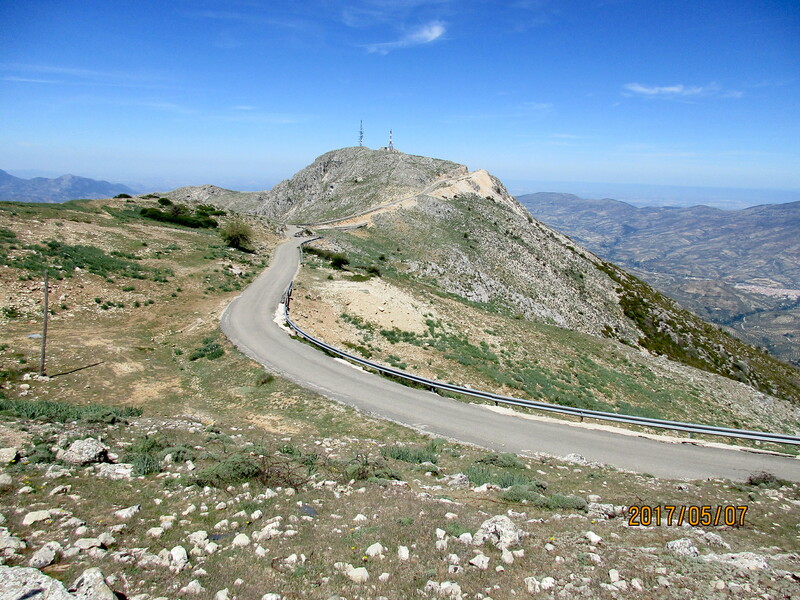 The road then switchbacks left, then right, then eventually tops out at around 9.5 km and 528 meters of climbing. Continue gently downhill for another 3.5 km. Just after KmM 23, where the road bears right across an embankment, there is a paved road heading up to the left. This is the start of the main climb. I read that cars are not allowed on this road, but saw one tourist car driving up it and another parked at the top. The road surface is not great to start but improves as you climb. The first kilometer or so has plenty of 11-15% then eases at the switchback to the left. After 4 km you see a sign telling you that the next 1.8 km are 15%. Well, there is some 15% but it’s not all that steep. However, this is the hardest and most continuous section on the climb. If you are not too tired, enjoy the views of Valdepeñas de Jaén down to the right. By km 6 the angle eases but there’s another short 15% section at km 7. After this you are faced with a 15% downhill before some more climbing brings you finally to the gate at the top. You’ll reach this after 8.5 km and 696 meters (2,283′) of climbing from the A-6050. Turn around and ride down, then back up the short 15% ascent. For extra credit, climb the short steep concrete road on the left to the other towers. Once back at the A-6050, turn right and climb easily to the high point then a delicious descent takes you enjoyably back to Los Villares. Ronda is a very touristy town. It’s most famous for the old city on the top of the cliffs, and the Puerto Nuevo (New Bridge, built in the 1700’s) that crosses the deep gorge that splits the town. Allegedly, during the 1936-1939 Spanish Civil War, both sides killed captured opponents by throwing them into the gorge from the bridge. Ronda has a bit of a split personality. There’s the lovely old part: the touristy part with the Puerto Nuevo and the popular pedestrian mall, the Carrera Espinel. Then there’s a newer part which feels cheap and shabby. The land around Ronda is very hilly, with lots of small roads that see little traffic. You could find a semi-infinite number of rides by creating different combinations of the quieter roads. We were in Ronda for 7 days, hoping to explore more of the riding, but we had 4 rainy days and only rode on the three sunny days. You can ride everything from Ronda but sometimes this means riding on rather busy roads. We chose to drive to the start of the rides we did, and that’s how I describe them. A fantastic ride, one of the best I’ve done in quite some time. 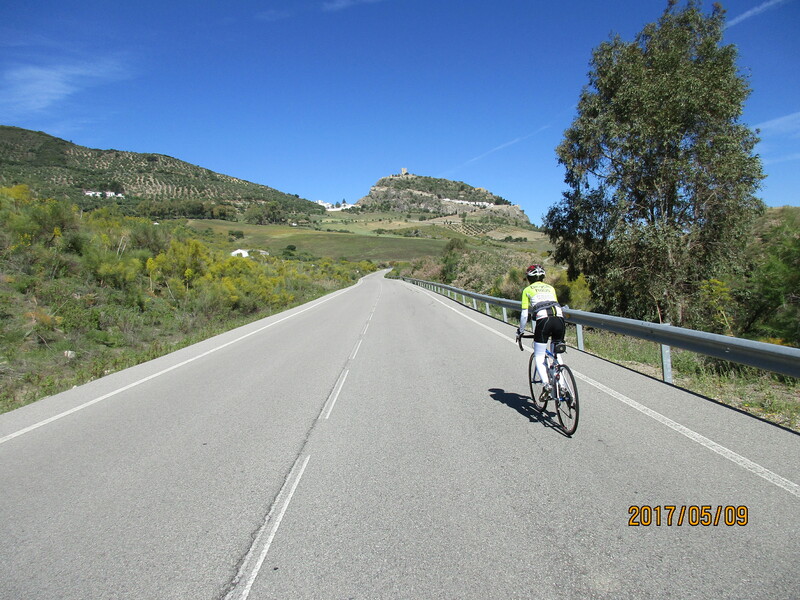 We rode the loop through Zahara and Grazalema which makes a wonderful outing of 38.5 km with 960 meters (3,150′) of climbing. Far and away the best direction is counter-clockwise because the climb from Zahara to the top is just incredible. It’s quiet, and it feels big and remote, with beautiful switchbacks in the upper part, and spectacular views. 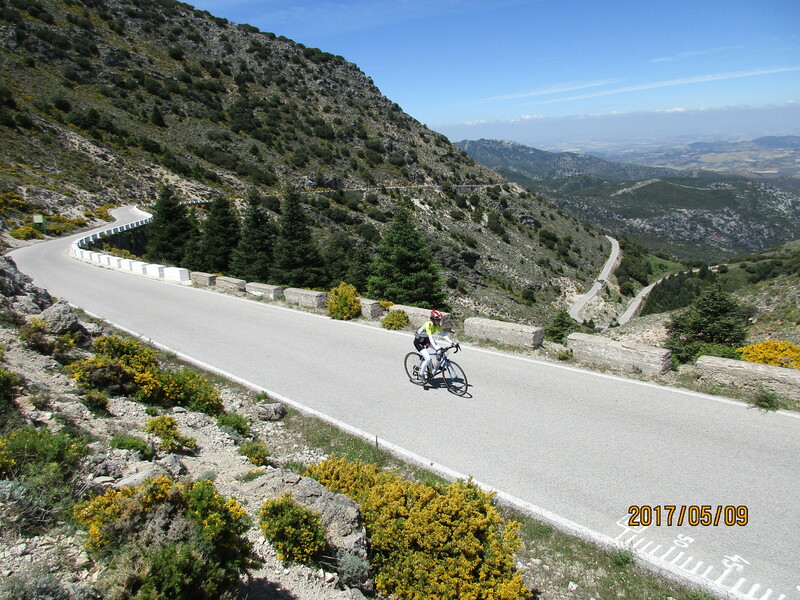 It’s also #21 of the 100 Greatest Cycling Climbs of Spain. We drove to the start of the loop from Ronda. Take the A-374 towards Montecorto. About 2 km past Montecorto turn left following signs for Zahara. 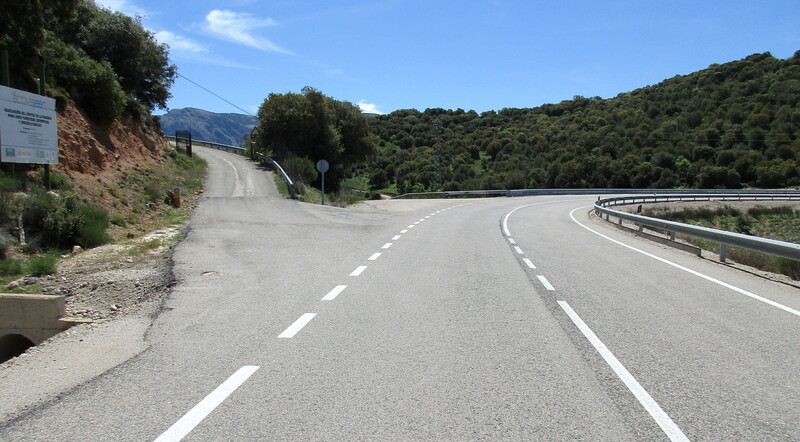 About 2.3 km from this turn you reach the CA-9123 which turns left towards Grazalema, just after the 18 KmM and before a short bridge on the right. We parked about 0.6 km back up the hill at a good parking area, but I started my Garmin at the turnoff to Grazalema. The next section just gets better and better. It starts by riding just below the beautiful white village of Zahara, then heads up the valley. As you look up you can see what looks vaguely like switchbacks high up on the mountain side. As you get closer you realize they are switchbacks, and you keep climbing, with increasingly lovely views. Finally you reach the Puerto de las Palomas about 14 km from the turnoff to Zahara. Head down the other side and after about 3 km turn left at the intersection towards Grazalema. Ride through the beautiful white village (stopping for a coffee or sandwich if you are so inclined) then head down out of town. Shortly after you leave town, turn left up the hill on the CA-9123 towards Algodonales. After a short steep climb you descend down a wonderfully twisty road to the start of the loop. This section feels very rural, in contrast to the climb up from Zahara. Extra Credit: 24.8 km and 784 meters of climbing. There is another climb up the back of Puerto de las Palomas which is worth doing if you have the time and energy. Be warned though, the climb is much less interesting than the climb from Zahara, and the views are not nearly as good. Instead of turning left at the intersection after you descend from Puerto de las Palomas, instead turn right. 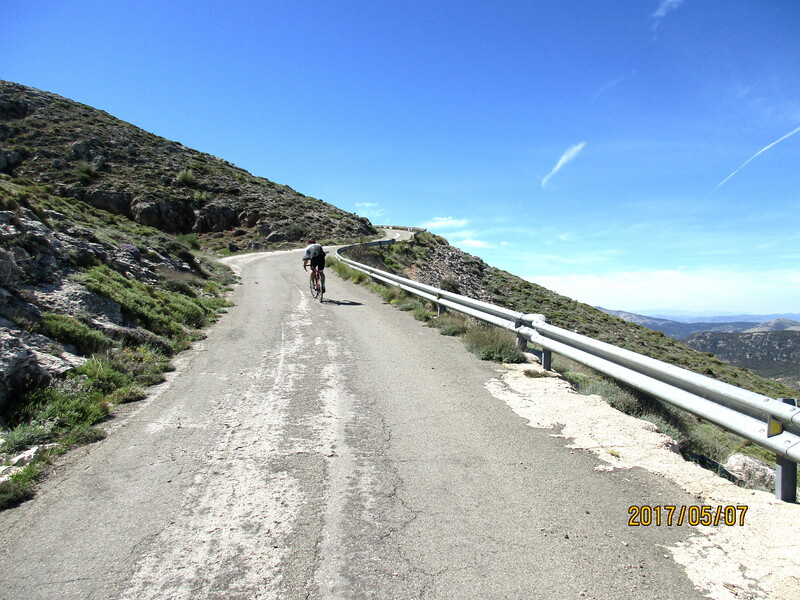 Climb up for about 2 km and 126 meters of elevation gain to Puerto de El Boyar, then descend for 10.4 km to where the road flattens and a right-hand turn leads to Benamahoma. Turn round here and ride back up to Puerto de El Boyar. This give you 658 meters of climbing. This is a wonderful rolling ride, lots of uphill, lots of downhill, and hardly any flat. There are quite a few very steep sections of 13% with a few places that reach 15%. It’s open, with lovely views; nothing dramatic, just very pretty with steep farmland and some beautiful white villages. Because the lollipop is open, it probably gets very hot in summer. 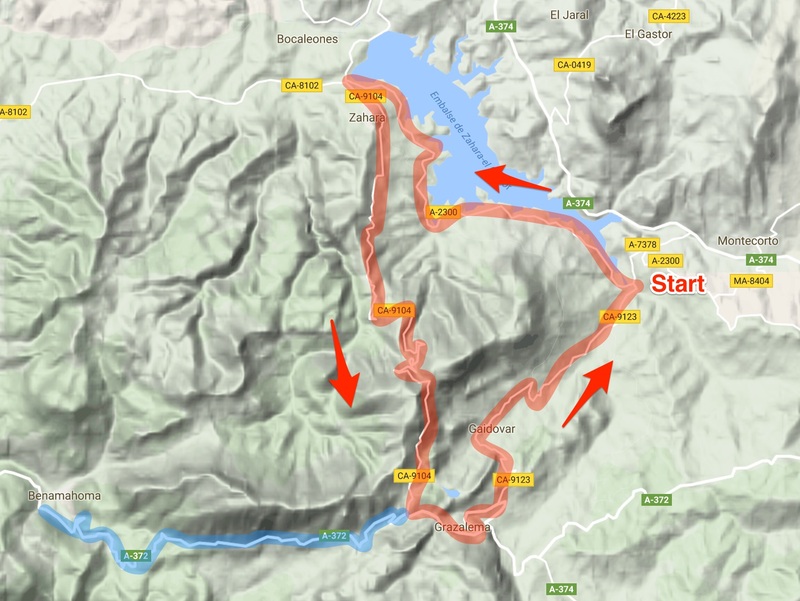 The whole ride is about 53.8 km with 1,450 meters (4,757′) of climbing. The ride is a lollipop, with the stick being the section between Montecorto and Los Villalones, and the lollipop itself being the section around Los Villalones, Setenil, and Olvera. There was very little traffic on most of the roads. Drive to Montecorto on the A-374. Drive up through Montecorto and as you leave the village there is a very large parking area on the left. This is where we parked. From here there’s no warmup, so just head uphill, with plenty of 11-13% for the first few kilometers. From here there are enough turns and decision points that I’ll describe them in a bullet list. At km 4.8 km (KmM 0), turn left following the sign for Los Villalones. At km 7.8, at the T-junction in the tiny village of Los Villalones, turn right on CA-9113. At km 13.6, after a long gradual uphill, there’s a turn to the right but ignore this and continue towards Setenil. As you enter Setenil, at km 16, turn left following the sign to Olvera. Setenil is an amazing white village, set in the bottom of a gorge, unlike most of the white villages which sit on the tops or sides of hills. It’s worth seeing so if you have the inclination continue down into the village before heading towards Olvera. There’s now a beautiful descent into a little gorge. At km 24.5 you enter the white village of Torre-Alháquime, and are immediately faced with 15% – mercifully short. At km 28.5 turn left into Olvera. You are now just over half-way so you might consider food or a drink at one of the cafes along the main street. In the center of Olvera, head down the road to the left, after going round the roundabout. Keep bearing left. At km 31 go straight ahead, under the bridge, on the CA-9109, following the sign for El Gastor. At km 40.5 turn left on the CA-9111 following signs for Setenil and El Gastor. In 1 km you climb a short little section of 15% then reach a T-junction. Turn left on the CA-9113 following the sign for Setenil. At km 46.3, again in tiny Los Villalones, turn right following the signs for Acinipo and Ronda. Another steep climb of about 2.7 km takes you to the top of the hill at km 49 and a right turn to Montecorto on MA-8447. It’s mainly downhill for the next 4.8 km back to Montecorto. A strange but interesting loop through tree-covered hills, infinitely twisty and uncompromisingly hilly. I was fascinated to see it on a map and decided I wanted to ride it. I saw several other riders, all Spanish, so it’s a reasonably popular ride for cyclists who know about it. There’s very little traffic on this lollipop. 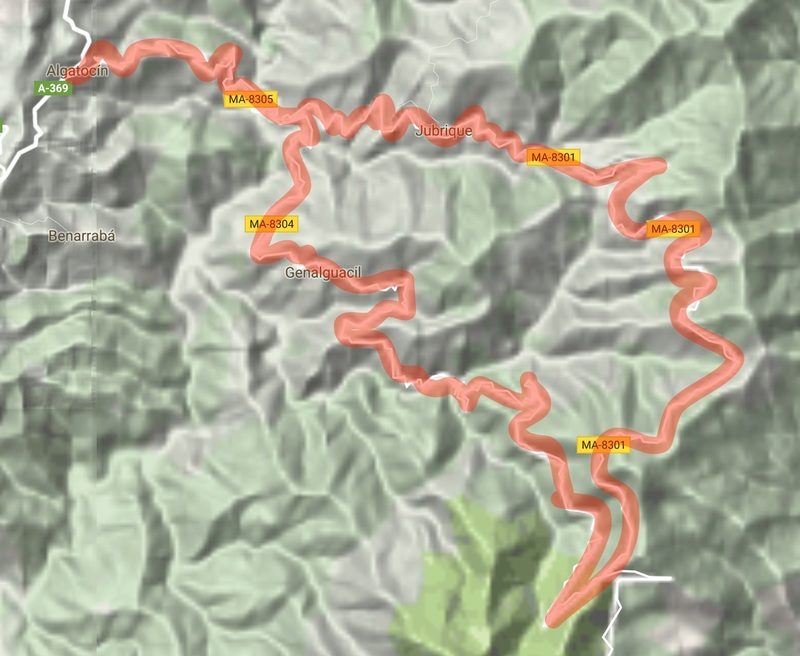 The whole ride is about 60.1 km with 1,710 meters (5,610′) of climbing. Drive or ride along A-369 from Ronda to Algatocín. I drove, and parked in Algatocín. 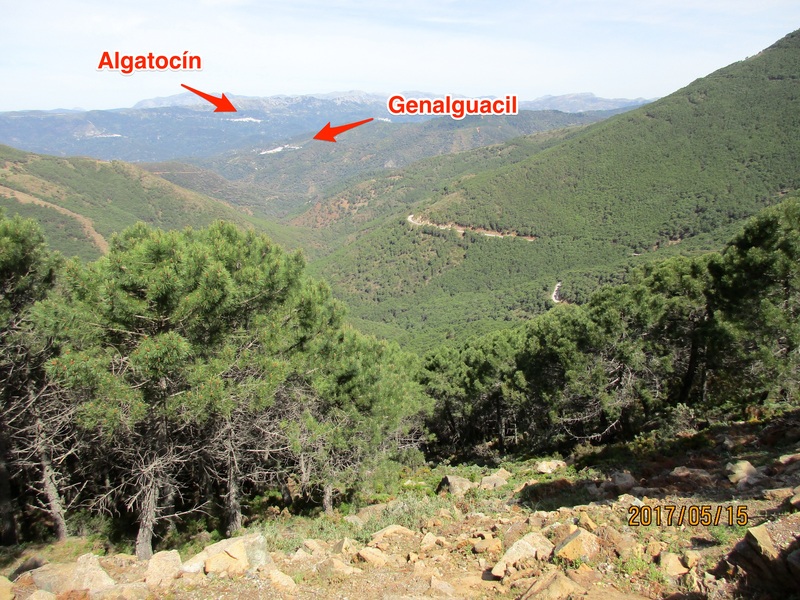 Head downhill, following the signs for Jubrique and Genalguacil. After riding down the lovely twisty road for 7 km you cross a small bridge and start climbing. At km 8.15 you reach a decision point. Turn left for Jubrique or right for Genalguacil. Counter-clockwise has more descents on the climb, whereas clockwise seems to be more of a constant climb. Your choice. I did the loop counter-clockwise so I turned right, and this is the way I will describe the loop. Turn right towards Genalguacil, which you reach at km 13. Climb through town at a 14% gradient, then as you leave town and head down on a beautiful new road surface, you also see new barriers at the side of the road, and a new footpath. You see this sort of thing in several places around the loop and you wonder why is some of the road beautifully new, and next to it is much rougher road? Who makes the decisions to repave parts but not other parts? Anyway, keep climbing, with occasional descents, until you cross a small bridge at 20 km and face a short steep section of 13-15%. At 29.7 km you reach a T-junction signed to Estepona on the right and Jubrique on the left. Turn left and head towards Ubrique. You are still climbing but very gently and at km 32.2 you reach the high point, having climbed 1,100 meters. The views in this upper section are probably the best views on the ride, looking out over deep tree covered valleys and hills to the far-away white villages you left. A few km further on, the road surface becomes rougher, but at km 39 it becomes beautifully smooth again. At km 41 there’s a short uphill which reaches 12% then you descend into Ubrique at km 47. At km 52 you reach the end of the loop, where you made your clockwise/counter-clockwise decision, and you turn right back along the lollipop stick. In another kilometer you cross the small bridge and start the 7 km climb back up to Algatocín.